Every parent in the UK has, at some point, been called on to run in the “Parents’ Egg and Spoon Race”. 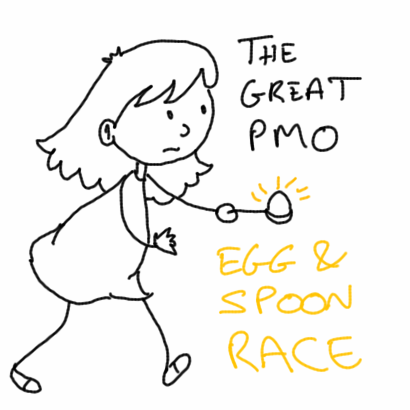 Now, if you don’t know what an egg-and-spoon race is, check out this video (bit of British humour). It is, obviously, a race. With an egg. And a spoon. But it has much to teach PMs and PMOs. And executives. The challenge is to balance an egg on a spoon and then navigate the course as quickly as possible, and the age-old dilemma is whether you should go quickly or slowly. The faster you go, the more likely you are to drop the egg. The slower you go… well, you might not drop the egg, but you ain’t gonna win the race and if there’s one thing Parents’ Egg-and-spoon races are really about, it’s winning! What’s this got to do with having too many projects? Well, if you have too many projects, your team will end up being inefficient. They’ll be inefficient because they will end up time-slicing which slows you down and because they’ll make mistakes (dropping the egg, so-to-speak) which will really slow you down. And if you have too few projects (which almost never happens), you’ll end up “gold plating” everything – delivering projects that are beyond the required scope and anything beyond what’s needed is, you could argue, waste. (Note: in this webinar, Mike Hannan argues that this happens all the time at the project level because of the way we manage risk). So there’s a happy medium where you can maximize “value delivery” to the organization. You’re not trying to do so much that you “drop your eggs”, but you’re working efficiently. If everyone gets this, why is it that you always end up with too many projects? Why do you have too many projects? Every company has a project prioritization process. Sometimes it’s pretty informal, other times it’s very formal. But formal is not the same as effective. You can have a very formal process, one that involves lots of Powerpoint slides, spreadsheets or even your PPM system’s prioritization module, one that involves the whole executive team in off-site meetings but that process can still get it badly wrong. The bottom line is that, if you have too many projects, it's because your project prioritization and selection process is broken. This page will show you how to prioritize projects the "right way". I’ve said this before, and I make no apology for repeating myself: Not all project prioritization techniques are valid. Let’s assume you, at least, have some scoring mechanism for projects (if you don’t then you’re leaving the whole process open to politics and you’ll get what you deserve, I’m afraid). Most PMO leaders I ask have a scoring mechanism that is homegrown or, at best, based on a PPM tool’s methods which, themselves, have little validity or depth. A good project prioritization process has two dimensions; it is there to improve the quality of the decision and to improve buy-in to the decision (which translates into executive sponsorship). Both of these dimensions are important. There are tools out there that have been rigorously designed (and tested over decades of academic research) with these two goals in mind. In fact, there are only 2 methods for prioritizing projects that research shows are suitable, one of which is the Analytic Hierarchy Process (AHP). We like it so much, we put it at the heart of our prioritization software. This is not trivial. If you do this badly (or not at all, as is usually the case), you end up with execs sitting around a table who have no confidence in the data they are being presented. And it is this lack of confidence that underpins the failure to pick a “right-sized” portfolio. Oh, everyone’s joined in! They are all jamming in their own projects… but…. I can’t shoot down their projects in case they start shooting down mine…. So… looks like we’ll just have to jam them all in and hope for the best! To get an idea of how AHP solves this problem, you can watch this 15 minute webinar. Weak project estimation: If your estimation is weak, you will, most likely, underestimate more than you overestimate. This is a natural human bias (and you’re probably under pressure from the person requesting the project). This means that even if you pick projects that look like they’d fit, you’re still toast! Weak scope management: So we put together a project request, the project got approved and off we go! But now the scope starts to expand. Suddenly, you have too few resources and you’re toast! Again! By keeping a really tight focus on the business goals of the project and asking “is this really required?” time and time again, you can greatly reduce this effect. I would be really happy if I never heard a PMO leader complain about having too many projects, but that’s not going to happen until, as an industry, PMOs realize that they have to take ownership of the prioritization process. Not of the decision. That should absolutely sit with “the business”. The PMO (or EPMO or someone of a similar nature) should, in my view, take ownership of the process of collecting project ideas, documenting them, filtering them and then presenting them to the executives in a way that makes it easy for them to make a well-informed decision. This is not really any different to what a PMO does all the time. Part of the role of PMO, after all, typically involves finding and disseminating best-practice throughout the team and that should apply to the prioritization process just as much as the project implementation process. But how can you start the discussion? Well, my recommendation would be to quickly carry out a health-check of your portfolio and to make the problem visible. This will allow you to build a case to change the way things are done. When proposing change, having a strong, data-driven business case is the best way to avoid ending up with egg on your face!